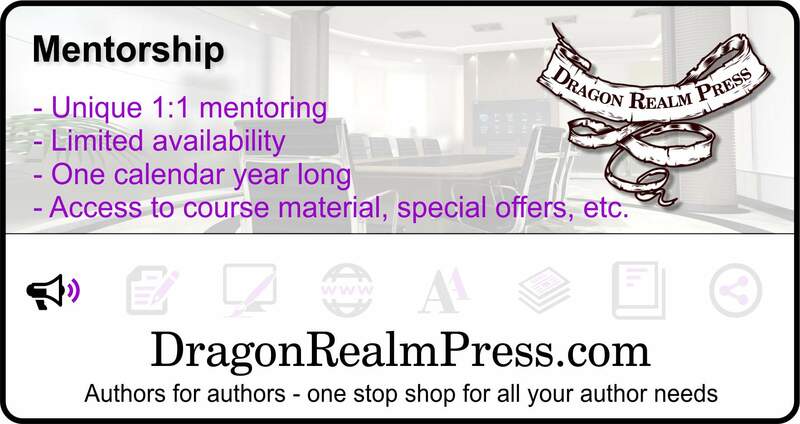 Dragon Realm Press is pleased to offer a highly customised mentorship program to a limited number of clients over the course of the year. The program incorporates a range of author services, including consulting–a highly popular 1:1 personal service. As this is so time-intensive, we can only offer this to select few clients. For a limited time, we are taking on a handful of new consultant clients based on a first-come, first-serve basis. Weekly check-ins based on author needs. Complete brand critique (social media, books, pen names, connections, subscribers, etc.). Weekly author posts in specific Facebook group–anything from publishing, growing you audience, keywords and categories, etc. Access to all course, including Facebook ads, Amazon ads, social media for authors (plus any new courses we start in 2019). Book launch plan critique and guidance. 10% off other Dragon Realm Press services (excludes existing offers). Each 2019 book launch will receive a full Amazon page critique (title, blurb, categories, keywords, etc.). Graphics package for one book launch. Beginner: Authors new to the business who are struggling to figure out everything ‘authory’. Advanced: Established authors needing to take it to the next level. Authors who complete this form will receive a notification with further instructions within seven business days from info@dragonrealmpress.com. Please ensure you add this address to your email whitelist to ensure you don’t miss out. * A separate Facebook group will be dedicated to each level, where weekly posts will be dropped, addressing different topics within the author business. These posts will be tailored to the authors’ needs.